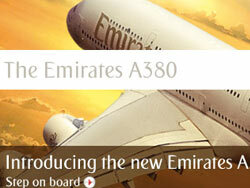 March 13- Emirates Airline will add one more A380 to its London Heathrow routes from July 1, 2010, it was learnt. The A380 will be deployed on EK 003, which departs Dubai at 1415hrs and arrives in London Heathrow at 1840hrs. The double-decker aircraft which has been custom-made for Emirates includes onboard lounges, showers and spas. Speaking on the occasion, Salem Obaidalla, Emirates Senior Vice President, Commercial Operations, said: “London Heathrow was one of the key airports we had in mind when the A380 was first conceived and the new deployment allows more passengers travelling to and from the British capital to experience this remarkable aircraft." EK001 departs Dubai daily at 0745hrs, arriving in Heathrow Terminal 3 at 1215hrs. The return flight, EK 002, departs Heathrow daily at 1415hrs, arriving at Dubai International at 0005hrs the following day. EK 003 leaves Dubai at 1415hrs and arrives in London Heathrow at 1840hrs. Dubai-bound, EK 004 leaves Heathrow at 2040hrs and gets into Dubai at 0630hrs the following day.